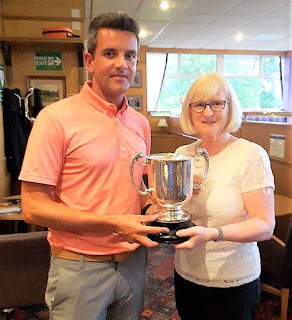 Gordon Yates (Colville Park) won the Lady Lockhart de Robek trophy yesterday at Carnwath Golf Club by a record 10 shots. He had rounds of 65 and 63 for a 12-under-par total of 128. In second place was Craig Hughes (Glenbervie) with 68 and 70 for 138. Gordon is pictured with Carnwath vice-captain Mrs Janet Kennedy. 128 Gordon Yates (Colville Park) 65 63. 138 Craig Hughes (Glenbervie) 68 70. 139 Barry Hillis (Carnwath) 69 70. 140 William Steele (Lanark) 72 68. James Paterson (Hayston) 71 71, Graham Rankin (Drumpellier) 70 72. 144 John Ralston (Shotts) 74 70; John Mitchell jun (Carnwath) 73 71. 147 Stuart Geddes (Erskine) 79 68 , Dominic Douglas Drumpellier) 74 73, Chris Orr (Lanark) 68 79 , Des Fearon (Colville Park) 71 77. Blair Forsyth (Drumpellier) 74 75.